Details about Justice Department official Bruce Ohr's meetings with the author of the salacious anti-Trump dossier were shared by Ohr with his expansive circle of contacts inside the department -- including senior FBI leadership and officials now assigned to Special Counsel Robert Mueller’s investigation, Fox News has learned. According to online bios, Bruce Swartz was identified as a deputy assistant attorney general. Andrew Weissmann was chief of the DOJ Criminal Division’s Fraud Section before becoming a senior prosecutor on Mueller's team handling the case of former Trump campaign chairman Paul Manafort. According to a May 2017 New Yorker profile, Zainab Ahmad worked at the U.S. Attorney’s office in the Eastern District of New York and took a leave to work for then-Attorney General Loretta Lynch at the Justice Department’s Washington headquarters. Ahmad is now assigned to the special counsel's investigation. Fox News asked the FBI, Justice Department and special counsel's office whether the meetings with Ohr over Steele and the dossier were consistent with -- or in conflict with -- existing DOJ or FBI rules, including chain-of-custody procedures for handling evidence. 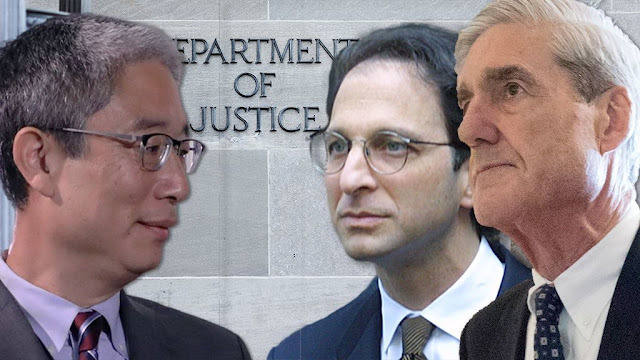 In addition, the special counsel's office was asked whether Weissmann and Ahmad had fully disclosed their contacts with Bruce Ohr and others over the dossier. The FBI and special counsel declined to comment; the DOJ did not immediately respond. The Ohr testimony also seems to conflict with a 2018 memo from Democrats on the House Intelligence Committee, on the surveillance warrant application for Trump campaign aide Carter Page, which relied heavily on the dossier. While Ohr’s testimony indicated he met with senior FBI leadership in August 2016 shortly after a meeting with Steele, the Democrats' memo stated “the Majority mischaracterizes Bruce Ohr’s role, overstates the significance of his interactions with Steele, and misleads about the timeframe of Ohr’s communications with the FBI” saying Ohr told the bureau in November 2016 about his earlier communications with Steele. During his testimony, Ohr said he stressed during the 2016 meetings, many of which took place before the Page surveillance warrant was obtained, the potential bias and conflicts associated with Steele and the dossier that was commissioned by the DNC and Clinton campaign and handled by the opposition-research firm Fusion GPS. The surveillance warrant application drew on the unverified Trump dossier. Critics have pointed to apparent inconsistencies in Simpson's testimony. During his November 2017 transcribed interview before the House Intelligence Committee, Simpson was asked about his contact with the FBI. He said he worked with Ohr "sometime after Thanksgiving" in 2016. However, Simpson's testimony contradicted Ohr emails that showed they made contact months earlier, in August. Some details of the Ohr testimony were reported earlier this week by the Epoch Times.